Forget ironing – trying steaming! When you are a busy, ironing is the most mundane and time consuming exercise. I generally pile my ironing up to do in one go, so my Sunday evenings are spent ironing (for about 2 long hours!). I don’t enjoy it but we have to make sure the kids have their ironed school uniforms!. Dragging the ironing board out, unravelling the iron cord, setting the whole area up. It’s all a drag. I’m getting depressed just thinking about it! 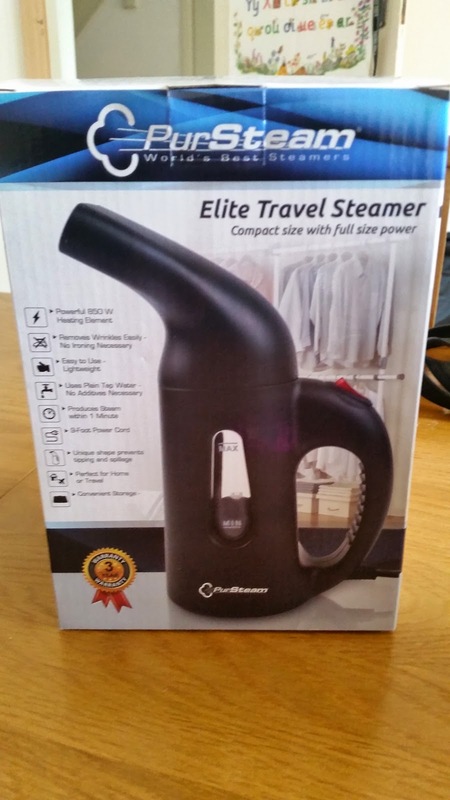 But, I got to try out the handy little Elite Travel Steamer from Amazon. This is a powerful little unit and it really put a smile on my face. The steamer is a portable travel steamer and works within 60 seconds. This steamer works on all fabrics. Just hold it upright and the steam removes your creases on both sides of your garment. I was using it to iron my husbands shirts (which I NEVER iron as they take too long!). I ironed the first shirt, and thought, this can’t be right, it took me about 1 minute to iron his shirt. This is mainly because the steam works directly on the creases but also, you don’t have to turn the shirt over to work on the reverse, saving you time and effort! I loved the steamer, and I think my husband loves it even more as I’ve ironed 3 of his shirts for next week already! He is a happy man! I might throw my ironing board away too. I’ve already decided to take this on holiday with us. It’s the perfect size and comes with a little travel bag. Five Guys burgers – 5 stars!